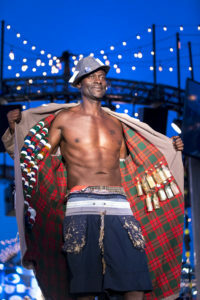 More than 700 walked the planks at our annual awards gala … and lived to tell the tale, reports Communications Director Matthew King. 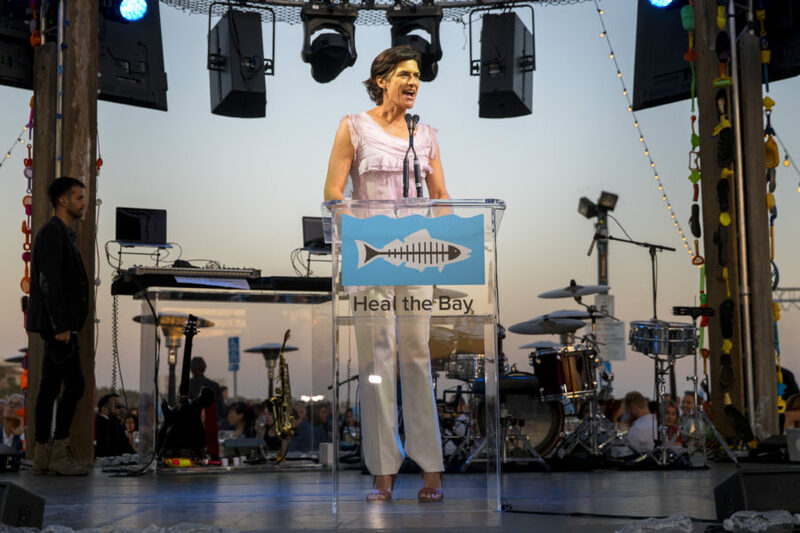 With that offbeat reminder, actress and honoree Sharon Lawrence brought Heal the Bay’s 26th annual “Bring Back the Beach” gala last night to a funny, fitting close. 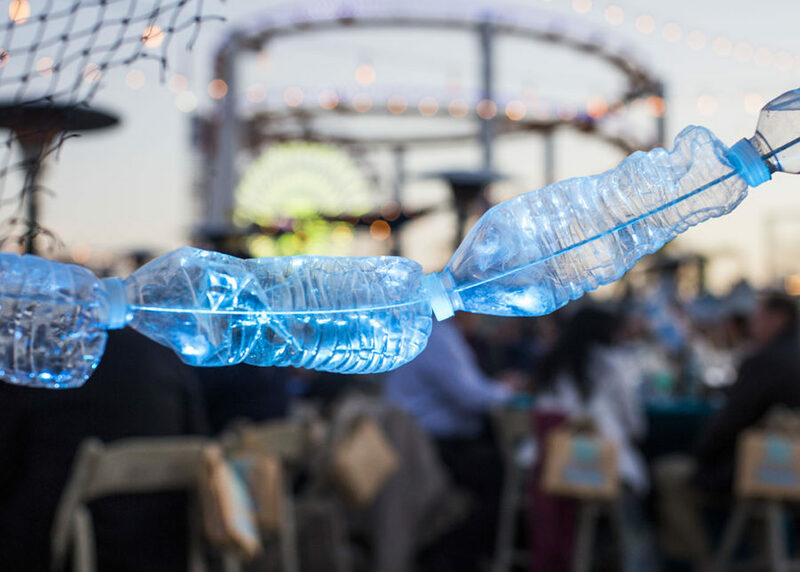 Over 700 guests joined us on the wonderfully funky deck of the historic Santa Monica Pier for a night of celebration and renewed commitment to the ongoing fight for clean oceans and inland watersheds. 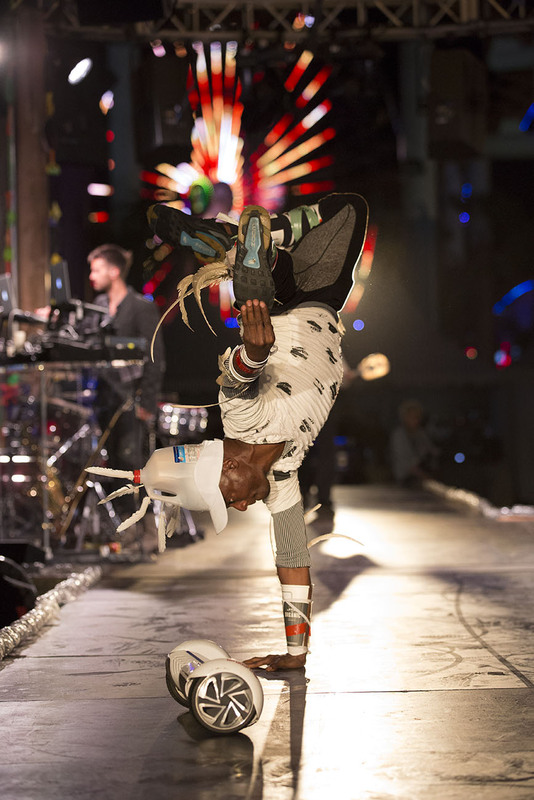 While a carnival atmosphere prevailed (stilt walkers, jugglers, popcorn, spinning Ferris wheel), the true spirit of the evening was one of resolve. Dr. Shelley Luce, our new president and CEO, earned rousing applause for vowing to thwart the new federal administration’s plan to downsize the EPA and weaken the Clean Water Act. 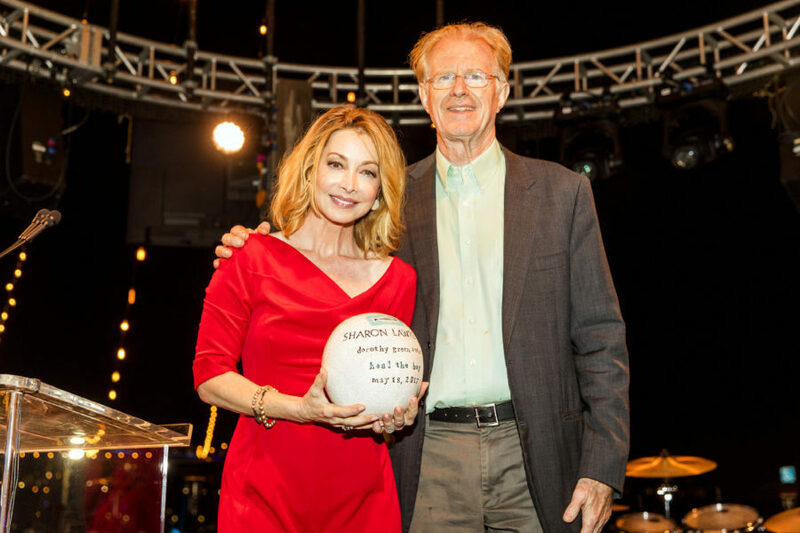 Sharon Lawrence, a longtime board member and public ambassador for our work, received the Dorothy Green Award, named after Heal the Bay’s late, founding president. Gracious as ever, Lawrence recognized by name the long lineage of female water warriors – including mermaids! – involved in our work. Her mother and father, who had driven across the country to see Lawrence receive the award, beamed with pride. A very sweet scene. 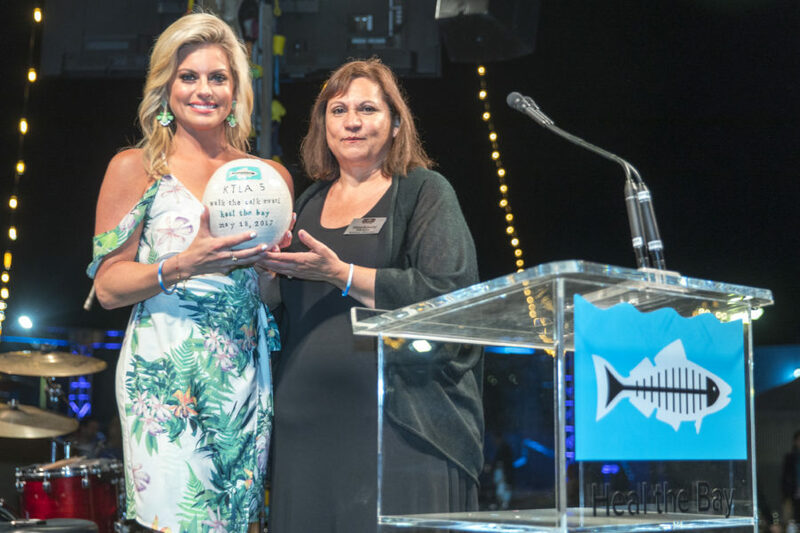 Local broadcast station KTLA 5 earned the night’s “Walk the Talk” award for its decades-long connection to Heal the Bay. 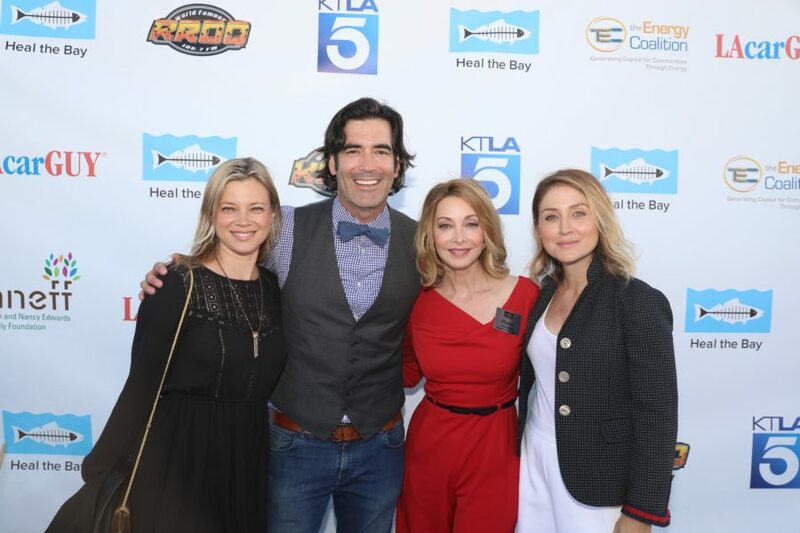 Led by surfer and media honcho Don Corsini, KTLA has made space on its airwaves to promote our events and highlight ocean-related environmental issues. Anchor Courtney Friel accepted the award on the station’s behalf. 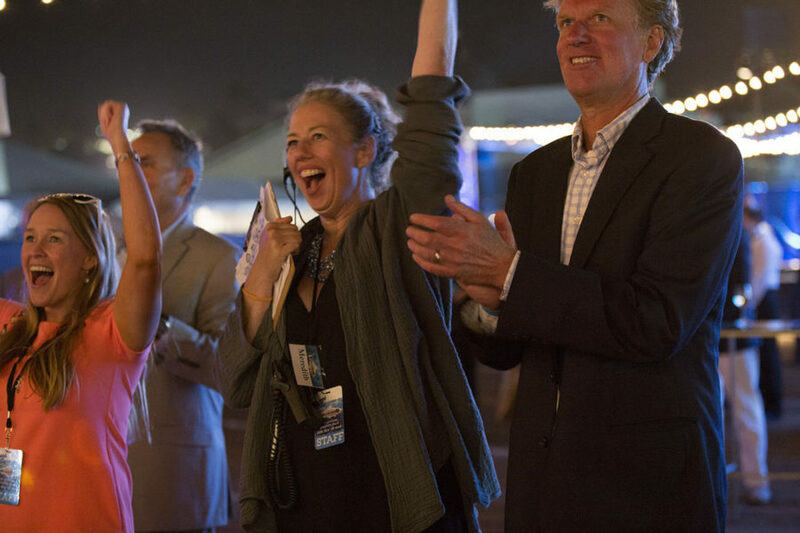 In between speeches and presentations, a lively mix of surfers, politicos, water policy wonks, engineers, business owners and everyday ocean lovers mingled and schmoozed as the sun set over a calm sea. 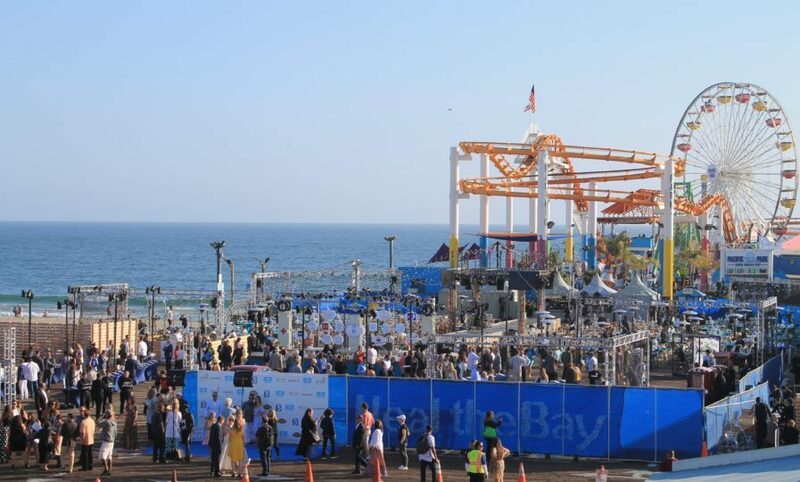 Event planners earned well-deserved praise for an innovative menu (roasted beet salad and Aussie handpies) and ocean-themed cocktails (blue margaritas and Golden Road’s kelp forest canned Heal the Bay IPA!). Mike Sullivan, LAcarGUY owner and longtime boardmember, won the best-dressed award in a vibrant Wonka-like suit-jacket and matching Technicolor shorts. 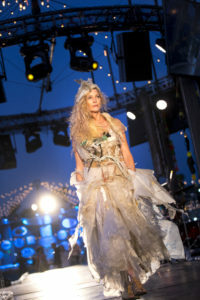 But even he was upstaged by a bevy of guest models sashaying down the catwalk in astonishing and truly beautiful dresses fashioned out of plastic trash commonly found on our shorelines. 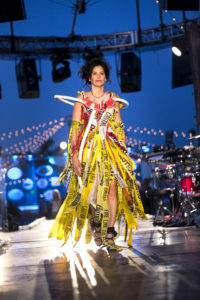 Kudos to designer Marina DeBris for raising awareness in such a creative way! 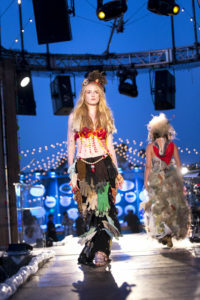 View our Facebook Live video of the “Beach Couture: Haute Mess” fashion show. 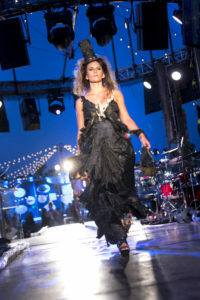 The gala is designed as a gathering of the tribe, but it also serves as a critical fundraiser for us. Attendees dug deep this year, breaking our all-time records for our live and silent auctions. 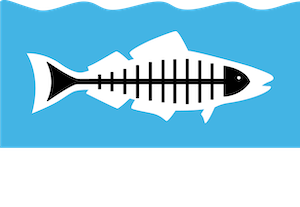 Funds raised from the evening directly support a number of our education and advocacy programs, from sponsored field trips to our Santa Monica Pier Aquarium to cleanups and water quality monitoring at local beaches and streams. 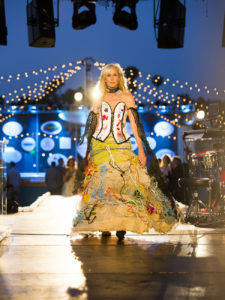 Among the other guests bidding and bubbling: actress, board member and new mom Amy Smart, getting a rare, free night-out with husband Carter Oosterhouse; Smart’s BFF and Heal the Bay ambassador Ali Larter; Oscar-nominated actress and new-to-us Marianne Jean-Baptiste; “Roxy Girl” and Heal the Bay activist Bruna Schmitz with husband and pro surfer Dane Zaun; KROQ brass dancing away to SoulCirque (Heal the Bay is longtime beneficiary of the station’s annual “Weenie Roast” benefit concerts); legislative environmental leaders Assemblymember Richard Bloom and former Senator Fran Pavley; skateboard legend Natas Kaupis; and kid celeb Heal the Bay ambassadors Chloe Noelle and Jax Malcolm, along with actors Carolyn Hennesy, Sasha Alexander, Gregory Harrison and Ed Begley Jr.
View photos from the 2017 Gala at Santa Monica Pier and the Blue Carpet. 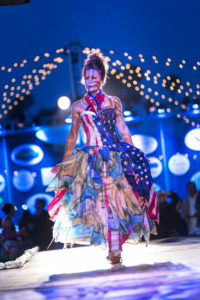 Also, thanks to our sponsors The Energy Coalition, The John and Nancy Edwards Family Foundation, LAcarGUY, KROQ, and KTLA 5 as well as our brilliant volunteer photographers Nicola Buck and David Young-Wolff for making it a very memorable evening.